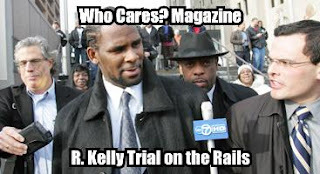 The R Kelly trial is on the rails for the prosecution! The reporter won't give up the source of the video tape! People agree that Shonna wasn't the girl in the tape! Will R Kelly "get off?" Who Cares! Actually, I find it amusing when these people end up in court - because when they stand in front of the judge they have to use their real names. Their full names. In this case it's: Robert Sylvester Kelly. What's up, Puddy Tat? "I think I saw a Puddy Tat!"